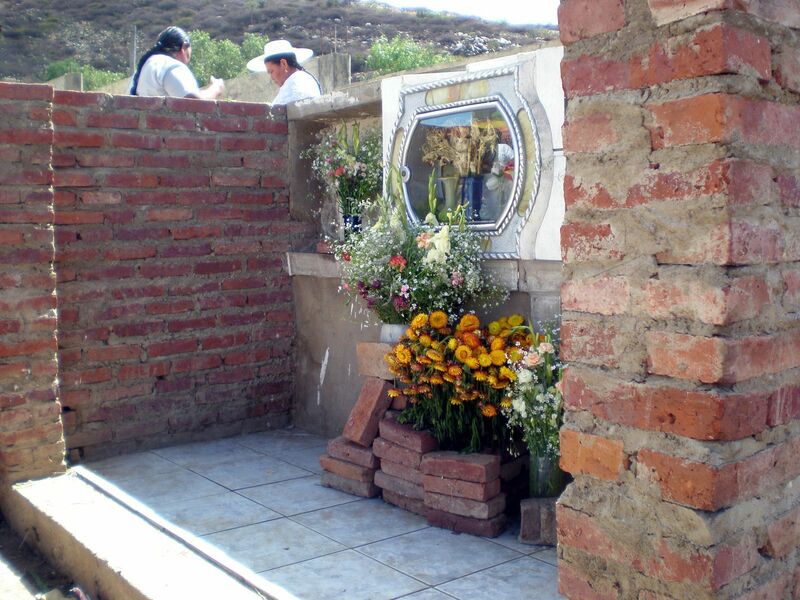 Every year, as All Souls Day approaches, I think of my time in Bolivia, most especially of the girls I worked with those two years in the orphanage. It’s important to explain the Catholic context behind these two days. All Saints Day, November 1, is a celebration of all the “saints“, canonized by the Church or not. Interestingly enough, “saint” and “holy” are the same word in Spanish so it is even easier to explain in Spanish. Who are the “saints”? Those who we may not recognize - those who may live an ordinary life but follow the will of God, who do everything for the love of God. In the United States, this is a holy day of obligation, meaning the Church asks all Catholics to come to Mass this day. The next day, we celebrate All Souls Day, November 2. This is a Church holiday to commemorate all those who have died, whether they’ve lived a saintly life or not. In Bolivia, this is the more important holiday of the two and certainly a more important holiday than it is in the United States. In a country where the life expectancy is 66 years old, everyone has their own dead to pray for. On All Souls Day, everyone visits the cemetery and prays…but first, before explaining those traditions, let me tell you what this holiday means for the girls here. On November 1, we had a Mass with the intention of all the dead family members and friends of the girls (and the employees). Sister Veronica read every one of them by name. I was in charge of collecting all the names. So my job was to walk around the orphanage and ask if there was anyone they wanted to pray for. The response was overwhelming. As typical in an orphanage, most had at least one parent on the list. I went to each one of them without thinking. When I got to Mileyda, I asked “Is there anybody that you want to put on the list?” She just looked at me for a few seconds in disbelief and laughed. “I don’t have anybody.” And then I remembered - Mileyda really doesn’t have anyone. And I don’t mean she doesn’t have any departed souls to pray for. Mileyda really doesn’t have any family. Nothing. I don’t think we know anything about any of her relatives, living or dead. Beatriz doesn’t have any family either. We know nothing about her relatives or her family or her story before she got here. She’s been living here for years and years; before that, lived in another orphanage. The director of that orphanage told Sister Veronica that Beatriz had come with a older brother but to this day, that is the only thing we know about Beatriz and we still haven’t been able to find her brother that she doesn’t even remember. Later that night, I was alone in the office making rosaries with Bernardita. Bernardita has been a friend of mine ever since I first arrived there in August 2007. She’s a high school sophomore and 16 years old. She has one sister here, Karen, who’s a high school junior and 19 years old. The both of them have such a unique laugh - joyful and kind of similar to Goofy. Bernardita, for some reason, gave me the nickname “Amandus” almost a year ago and it pretty much has stuck among the high-schoolers. I don’t know how it came up. Maybe we were talking about the dead we prayed for. I don’t remember but Bernardita started telling me her story. Bernardita and her sister came to the orphanage in 2000 - Bernardita 8 years old, Karen 11. Within a year of arriving, their dad died. Just a few years later, unexpectedly, their mom also died. Bernardita and Karen are complete orphans. In total, they have 4 siblings, three in other orphanages. The oldest immigrated to Brazil, now working but unable to afford to come back to Bolivia to visit his two sisters. Francisca, an eighth-grader, also ended up telling me her story the night of All Souls Day. Her dad died shortly before she was taken to the orphanage. That was almost 14 years ago, too long ago for her to even remember her dad. She has three brothers and sisters, and she is the youngest. According to Francisca, in total they were supposed to be 8 children - but 5 died either in childbirth or infancy. If you think about it, it must have been some miracle that Francisca survived, considering over half her brothers and sisters died before they could even grow up. After Francisca’s dad’s death, her mom had children with another man…the father of her half-sister, Matilde, who also lives in the orphanage. Matilde’s dad died not too long ago. These are certainly all terrible stories to hear around the month of Thanksgiving. After all, that is what November is for us Americans. Yet, after living in Bolivia, November has come to mean something different for me. It's become more of a somber month, a month of reflecting, both in gratitude but also in those who came before me. Those who shaped me but are gone now, both people I knew personally or indirectly. There's a sorrow in remembering them, knowing they are no longer with me, knowing that I can no longer touch them, that I can no longer hear their laugh or see their smile. Yet, in the end, as Christians, we know that death is not the end. This is what comforts me when I think of the friends I left behind in Bolivia. The fifty girls in the orphanage, some of whom are out on their own now. And people like Sister Delia, who I count among my best friends, who is about to leave for El Salvador in preparation for making her perpetual vows. Becoming a Daughter of Charity means that the chance of seeing my Bolivian friends again is slim to none. But I'm doing it anyway....and doing it with joy....because I know that although I may not see them again on this Earth, I hope to see them in heaven. That is what makes November so different. We remember the saints, not in pure curiosity, but as those who continue to help us beyond the grave. We remember the dead, but not in complete sorrow, but rather in the hope, in the joy of seeing them again. And we thank God for this life that He's given us, yes.....but also for the saints and souls who have passed before us and for this God who does not let them go unforgotten.